"Tree of heaven" redirects here. For the TV show, see Tree of Heaven (TV series). Ailanthus altissima /eɪˈlænθəs ælˈtɪsɪmə/,  commonly known as tree of heaven, ailanthus, or in Chinese as chouchun ( Chinese: 臭 椿; pinyin: chòuchūn; literally: 'foul smelling tree'), is a deciduous tree in the family Simaroubaceae. It is native to both northeast and central China, as well as Taiwan. Unlike other members of the genus Ailanthus, it is found in temperate climates rather than the tropics. The tree grows rapidly and is capable of reaching heights of 15 metres (49 ft) in 25 years. While the species rarely live more than 50 years, some specimens exceed 100 years old. Its remarkable suckering ability makes it possible for this tree to clone itself almost indefinitely  (since they are linked to the mother tree and thus partly fed by it, the suckers are less vulnerable than the seedlings and can grow faster). In China, the tree of heaven has a long and rich history. It was mentioned in the oldest extant Chinese dictionary and listed in countless Chinese medical texts for its purported ability to cure ailments ranging from mental illness to baldness. The roots, leaves and bark are still used today in traditional Chinese medicine, primarily as an astringent. The tree has been grown extensively both in China and abroad as a host plant for the ailanthus silkmoth, a moth involved in silk production. Ailanthus has become a part of western culture as well, with the tree serving as the central metaphor and subject matter of the best-selling American novel A Tree Grows in Brooklyn by Betty Smith. The tree was first brought from China to Europe in the 1740s and to the United States in 1784. It was one of the first trees brought west during a time when chinoiserie was dominating European arts, and was initially hailed as a beautiful garden specimen. However, enthusiasm soon waned after gardeners became familiar with its suckering habits and its foul smelling odour. Despite this, it was used extensively as a street tree during much of the 19th century. Outside Europe and the United States the plant has been spread to many other areas beyond its native range. In a number of these, it has become an invasive species due to its ability both to colonise disturbed areas quickly and to suppress competition with allelopathic chemicals. It is considered a noxious weed in Australia, the United States, New Zealand and many countries of central, eastern and southern Europe. The tree also resprouts vigorously when cut, making its eradication difficult and time-consuming. In many urban areas, it has acquired the derisive nicknames of "ghetto palm", "stink tree", and "tree of Hell". The leaves are large, odd- or even- pinnately compound, and arranged alternately on the stem. They range in size from 30 to 90 cm (0.98 to 2.95 ft) in length and contain 10–41 leaflets organised in pairs, with the largest leaves found on vigorous young sprouts. When they emerge in the spring, the leaves are bronze then quickly turn from medium to dark green as they grow. The rachis is light to reddish-green with a swollen base. The leaflets are ovate-lanceolate with entire margins, somewhat asymmetric and occasionally not directly opposite to each other. Each leaflet is 5 to 18 cm (2.0 to 7.1 in) long and 2.5 to 5 cm (0.98 to 1.97 in) wide. They have a long tapering end while the bases have two to four teeth, each containing one or more glands at the tip. The leaflets' upper sides are dark green in colour with light green veins, while the undersides are a more whitish green. The petioles are 5 to 12 mm (0.20 to 0.47 in) long. The lobed bases and glands distinguish it from similar sumac species. Immature seeds on a female tree. Tree of Heaven Re-sprouting even after herbicide use to restore Red Butte Creek in Salt Lake City. By removing invasive species like the tree of heaven which overcrowd native trees, the local ecosystem functions much better. 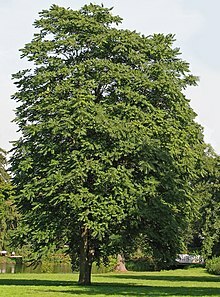 Light was shed on the taxonomic status of ailanthus in 1788 when René Louiche Desfontaines observed the samaras of the Paris specimens, which were still labelled Rhus succedanea, and came to the conclusion that the plant was not a sumac. He published an article with an illustrated description and gave it the name Ailanthus glandulosa, placing it in the same genus as the tropical species then known as A. integrifolia (white siris, now A. triphysa). The name is derived from the Ambonese word ailanto, meaning "heaven-tree" or "tree reaching for the sky". The specific glandulosa, referring to the glands on the leaves, persisted until as late as 1957, but it was ultimately made invalid as a later homonym at the species level. The current species name comes from Walter T. Swingle who was employed by the United States Department of Plant Industry. He decided to transfer Miller's older specific name into the genus of Desfontaines, resulting in the accepted name Ailanthus altissima. Altissima is Latin for "tallest",  and refers to the sizes the tree can reach. The plant is sometimes incorrectly cited with the specific epithet in the masculine (glandulosus or altissimus), which is incorrect since botanical, like Classical Latin, treats most tree names as feminine. A. altissima var. altissima, which is the type variety and is native to mainland China. Ailanthus altissima growing in Australia. In North America, A. altissima is present from Massachusetts in the east, west to southern Ontario, southwest to Iowa, south to Texas, and east to the north of Florida. On the west coast it is found from New Mexico west to California and north to Washington. In the east of its range it grows most extensively in disturbed areas of cities, where it was long ago present as a planted street tree. It also grows along roads and railways. For example, a 2003 study in North Carolina found the tree of heaven was present on 1.7% of all highway and railroad edges in the state and had been expanding its range at the rate of 4.76% counties per year. Similarly, another study conducted in southwestern Virginia determined that the tree of heaven is thriving along approximately 30% of the state's interstate highway system length or mileage. It sometimes enters undisturbed areas as well and competes with native plants. In western North America it is most common in mountainous areas around old dwellings and abandoned mining operations. It is classified as a noxious or invasive plant on National Forest System lands and in many states  because its prolific seed production, high germination rates and capacity to regrow from roots and root fragments enable A. altissima  to out-compete native species. For this reason, control measures on public lands  and private property  are advised where A. altissima has naturalized. In the 2013 book Teardown: Memoir of a Vanishing City by journalist Gordon Young, the tree is referenced in a description of the Carriage Town neighborhood in Flint, Michigan. ^ For a more thorough discussion, see the entry for Ailanthus altissima in the Wikimanual of Gardening at Wikibooks. ^ The Oxford English Dictionary (2nd ed.). Oxford University Press. 1989. ^ a b c d e f g h i j k Miller, James H. (1990). "Ailanthus altissima". In Burns, Russell M.; Honkala, Barbara H. Hardwoods. Silvics of North America. Washington, D.C.: United States Forest Service (USFS), United States Department of Agriculture (USDA). 2. Retrieved 7 February 2002 – via Southern Research Station (www.srs.fs.fed.us). ^ a b c d e f g h i j k l m n o p q r s t u Hu, Shiu-ying (March 1979). "Ailanthus altissima" (PDF). Arnoldia. 39 (2): 29–50. Retrieved 2010-02-07. ^ Davies, Rob (17 September 2006). "The toxic Tree of Heaven threatens England's green and pleasant land". The Observer. Retrieved 21 August 2010. ^ "Tree-of-Heaven Ailanthus altissima". Division of Forestry. Ohio Division of Forestry. Retrieved 22 October 2015. ^ a b c Felter, Harvey Wickes; John Uri Lloyd (1898). "Ailanthus.—Ailanthus.". King's American Dispensatory (18th ed., 3rd rev. ed.). Henriette's Herbal Homepage. A 2-volumes modern facsimileis published by Eclectic Medical Publications. ^ Ronse De Craene, Louis P.; Elspeth Haston (August 2006). "The systematic relationships of glucosinolate-producing plants and related families: a cladistic investigation based on morphological and molecular characters". Botanical Journal of the Linnean Society. 151 (4): 453–494. doi: 10.1111/j.1095-8339.2006.00580.x. ^ Sladonja, Barbara; Sušek, Marta; Guillermic, Julia (October 2015). "Review on invasive tree of heaven (Ailanthus altissima (Mill.) Swingle) conflicting values: assessment of its ecosystem services and potential biological threat". Environmental Management. 56 (4): 1009–1034. doi: 10.1007/s00267-015-0546-5. PMID 26071766. ^ a b Kaproth, Matthew A.; James B. McGraw (October 2008). "Seed viability and dispersal of the wind-dispersed invasive Ailanthus altissima in aqueous environments". Forest Science. 54 (5): 490–496. ^ Planchuelo, Greg; Catalán, Pablo; Delgado, JuanA (2016). "Gone with the wind and the stream: Dispersal in the invasive species Ailanthus altissima". Acta Oecologica. 73: 31–37. Bibcode: 2016AcO....73...31P. doi: 10.1016/j.actao.2016.02.006. ^ Dempsey, Amy (15 July 2010). "The heavenly tree with a seedy side" – via Toronto Star. ^ "Invasive tree-of-heaven: Leaves smell like rancid peanuts or well-used gym socks". ^ a b c d Shah, Behula (Summer 1997). "The Checkered Career of Ailanthus altissima" (PDF). Arnoldia. 57 (3): 21–27. Retrieved 2010-02-07. ^ Swingle, Walter T. (1916). "The early European history and the botanical name of the tree of heaven, Ailanthus altissima". Journal of the Washington Academy of Sciences. 6 (14): 490–498. ^ Dictionary of Botanical Epithets. Last accessed April 15, 2008. ^ a b c Huang, Chenjiu (1997). "Ailanthus Desf.". In Shukun Chen. Flora Reipublicae Popularis Sinicae. 43. Beijing: Science Press. pp. 1–5. ISBN 978-7-03-005367-1. ^ Li, Hui-lin (1993). "Simaroubaceae". In Editorial Committee of the Flora of Taiwan. Flora of Taiwan, Volume 3: Hamamelidaceae-Umbelliferea (2nd ed.). ISBN 978-957-9019-41-5. ^ a b c Pan, F.J. (1998). "Ailanthus altissima var. tanakai". 2006 IUCN Red List of Threatened Species. Retrieved 2010-02-07. ^ a b c d e f g h i Hoshovsky, Marc C. (1988). "Element Stewardship Abstract for Ailanthus altissima" (PDF). Arlington, Virginia: The Nature Conservancy. Retrieved 2010-02-07. ^ a b c d e f Kowarik, Ingo (2003). Biologische Invasionen – Neophyten und Neozoen in Mitteleuropa (in German). Stuttgart: Verlag Eugen Ulmer. ISBN 978-3-8001-3924-8. ^ a b Schmeil, Otto; Fitschen, Jost; Seybold, Siegmund (2006). Flora von Deutschland, 93. Auflage (in German). Wiebelsheim: Quelle & Meyer Verlag. p. 42. ISBN 978-3-494-01413-5. ^ a b Stešević, Danijela; Petrović, Danka (December 2010). "Preliminary list of plant invaders in Montenegro" (PDF). 10th SFSES 17–20 June 2010, Vlasina lake. Biologica Nyssana. 1: 35–42 (p.38). ^ "PGR Forum Crop Wild Relative Catalogue for Europe and the Mediterranean". PGRforum.org. University of Birmingham. 2005. Retrieved 2012-03-06. ^ Jani, Vasil (2009). Arkitektura e peisazheve (in Albanian). U.F.O. Press, Tirana. ISBN 978-99956-19-37-4. ^ Australian Weeds Committee. 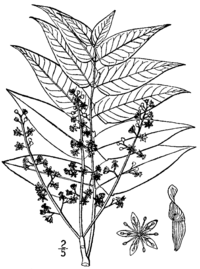 "Weed Identification – Tree-of-heaven". Weed Identification & Information. National Weeds Strategy. Archived from the original on 2009-07-06. Retrieved 2010-02-07. ^ "Tree of heaven". Pests & Diseases. Biosecurity New Zealand. Archived from the original on 2010-05-21. Retrieved 2010-02-07. ^ Shafiq, Muhammad; Nizami, M. I. (1986). "Growth behaviour of different plants under gullied area of Pothwar Plateau". Pakistan Journal of Forestry. 36 (1): 9–15. ^ "City urges residents to report invasive Tree of heaven". City of Cape Town. 2016-02-15. Archived from the original on 2016-02-22. Retrieved 2016-02-19. ^ Merriam, Robert W. (October–December 2003). "The Abundance, Distribution and Edge Associations of Six Non-Indigenous, Harmful Plants across North Carolina". Journal of the Torrey Botanical Society. 130 (4): 283–291. doi: 10.2307/3557546. JSTOR 3557546. ^ Stipes, R.J. (1995). "A tree grows in Virginia [abstract]" (PDF). Virginia Journal of Science. 46 (2): 105. Archived from the original (PDF) on 2011-07-16. ^ Munz, Philip Alexander; David D. Keck (1973) [1959–1968]. A California Flora and Supplement. Berkeley: University of California Press. p. 993. ISBN 978-0-520-02405-2. ^ McClintock, Elizabeth. "Ailanthus altissima". The Jepson Manual: Higher Plants of California. University of California Press. Retrieved 2010-02-07. ^ a b c Howard, Janet L. (2010). "Ailanthus altissima". Fire Effects Information System (FEIS). US Department of Agriculture (USDA), Forest Service (USFS), Rocky Mountain Research Station, Fire Sciences Laboratory. Retrieved 2018-06-24 – via https://www.feis-crs.org/feis/. ^ Grime, J. P. (October 9, 1965). "Shade Tolerance in Flowering Plants". Nature. 208 (5006): 161–163. Bibcode: 1965Natur.208..161G. doi: 10.1038/208161a0. ^ Knapp, Liza B.; Canham, Charles D. (October–December 2000). "Invasion of an old-growth forest in New York by Ailanthus altissima: sapling growth and recruitment in canopy gaps". Journal of the Torrey Botanical Society. 127 (4): 307–315. doi: 10.2307/3088649. JSTOR 3088649. ^ a b Heisy, Rod M. (February 1996). 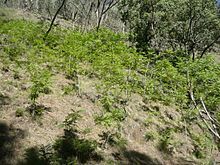 "Identification of an allelopathic compound from Ailanthus altissima (Simaroubaceae) and characterization of its herbicidal activity". American Journal of Botany. 83 (2): 192–200. doi: 10.2307/2445938. JSTOR 2445938. ^ Heisy, Rod M. (May 1990). "Allelopathic and Herbicidal Effects of Extracts from Tree of Heaven". American Journal of Botany. 77 (5): 662–670. doi: 10.2307/2444812. JSTOR 2444812. ^ Mergen, Francois (September 1959). "A toxic principle in the leaves of Ailanthus". Botanical Gazette. 121 (1): 32–36. doi: 10.1086/336038. JSTOR 2473114. ^ Lawrence, Jeffrey G.; Alison Colwell; Owen Sexton (July 1991). "The ecological impact of allelopathy in Ailanthus altissima (Simaroubaceae)". American Journal of Botany. 78 (7): 948–958. doi: 10.2307/2445173. JSTOR 2445173. ^ Barnes, Jeffrey K. (June 2, 2005). "Ailanthus webworm moth". University of Arkansas Arthropod Museum Notes. University of Arkansas. Archived from the original on 2010-06-18. Retrieved 2010-02-07. ^ Swearingen, Jil M.; Phillip D. Pannill (2009). "Fact Sheet: Tree-of-heaven" (PDF). Plant Conservation Alliance's Alien Plant Working Group. Retrieved 2010-02-07. ^ a b Keeler, Harriet L. (1900). "Simaroubàceae—Ailanthus family". Our Native Trees and How to Identify Them. New York: Charles Scribner's Sons. pp. 36–40. ISBN 978-0-87338-838-2. ^ Duke, James A. (1983). "Ailanthus altissima". Handbook of Energy Crops. Purdue University Center for New Crops & Plant Products. Retrieved 2010-02-07. ^ Barclay, Eliza. "The Great Charcoal Debate: Briquettes Or Lumps?". NPR. Retrieved 25 May 2013. ^ Gill, Barbara (2004). "Ailanthus". WoodSampler. Woodworker's Website Association. Retrieved 2010-02-07. ^ Dirr, Michael A. (1998) . Manual of Woody Landscape Plants (revised ed.). Champaign, Illinois: Stipes. p. 80. ISBN 978-0-87563-795-2. ^ Mitchell, Alan (1974). Trees of Britain & Northern Europe. London: Harper Collins. pp. 310–311. ISBN 978-0-00-219213-2. ^ a b Dirr, Michael A.; Zhang, Donglin (2004). Potential New Ornamental Plants from China (PDF). 49th Annual Southern Nursery Association Research Conference. pp. 607–609. Archived from the original (PDF) on 2010-06-25. Retrieved 2010-02-07. ^ a b c Kuhns, Mike; Larry Rupp (July 2001). "Selecting and Planting Landscape Trees" (PDF). Utah State University Cooperative Extension. p. 19. Retrieved 2010-02-07. ^ a b Burrows, George Edward; Ronald J. Tyrl (2001). Toxic Plants of North America. Ames: Iowa State University Press. p. 1242. ISBN 978-0-8138-2266-2. ^ Hartwell, Jonathan L. (1971). "Plants used against cancer. A survey". Lloydia. 34 (2): 205–255. PMID 4938826. This is installment 9 in a multiple part paper, published collectively as a book (Quarterman Publications, ISBN 0-88000-130-5, Bioactive Plants (series), 2) in 1982. ^ Kang TH, Choi IY, Kim SJ, Moon PD, Seo JU, Kim JJ, An NH, Kim SH, Kim MH, Um JY, Hong SH, Kim HM, Jeong HJ (January 2010). "Ailanthus altissima swingle has anti-anaphylactic effect and inhibits inflammatory cytokine expression via suppression of nuclear factor-kappaB activation". In Vitro Cell. Dev. Biol. Anim. 46 (1): 72–81. doi: 10.1007/s11626-009-9237-y. PMID 19789931. ^ Hu, Shiu-ying (March 1979). "Ailanthus altissima" (PDF). Arnoldia. 39 (2): 29–50. Retrieved 2007-05-30. ^ a b "Penn State Scientists: Tree of Heaven Really Isn't" (Press release). Penn State College of Agricultural Sciences. 1999-06-14. Archived from the original on 2012-02-22. Retrieved 2010-02-07. ^ Faulkner, William (1932). Sanctuary. Modern Library of the World's Best Books. New York: The Modern Library (Random House). pp. 135–6. OCLC 557539727. ^ Faulkner, William (1932). Sanctuary. Modern Library of the World's Best Books. New York: Modern Library (Random House). p. 148. OCLC 557539727. ^ Young, Gordon (2013). Teardown: Memoir of a Vanishing City. Berkeley, California: University of California Press. p. 1. ISBN 978-0520270527. ^ Fergus, Charles (2005). Trees of New England: a Natural History. Guildford: Falcon. p. 289. ISBN 978-0-7627-3795-6. ^ a b Collins, Lisa M. (December 10, 2003). "Ghetto Palm". Metro Times Detroit. Retrieved 2010-02-07. ^ a b Wasacz, Walter (January 30, 2007). "Big Ideas for Shrinking Cities". Model D. Archived from the original on 3 January 2010. Retrieved 2010-02-07. ^ Collins, Glen (March 27, 2008). "A Tree That Survived a Sculptor's Chisel Is Chopped Down". The New York Times. Retrieved 2012-03-06. Wikimedia Commons has media related to Ailanthus altissima. 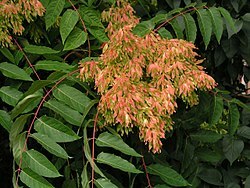 Calflora Database: Ailanthus altissima (Tree of Heaven, Ailanthus) — introduced invasive species.